There are no direct flights to the British Virgin Islands from USA, Canada or Europe; however the British Virgin Islands can be reached from Puerto Rico, St. Thomas, Antigua, St. Kitts, St. Maarten, and Barbados. There are three airports in the British Virgin Islands. The main airport is Terrence B Lettsome International Airport , located on Beef Island which is just east of Tortola, these two islands are connected by a small bridge. 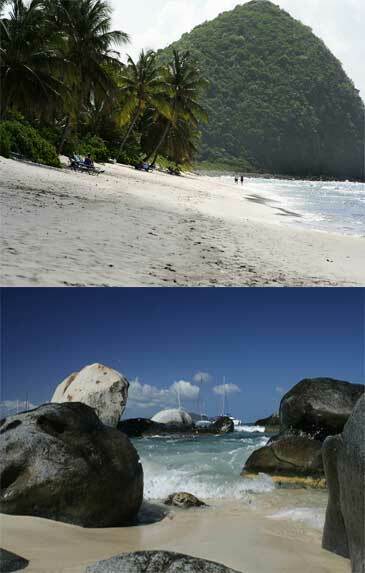 The other two smaller airports are located on Virgin Gorda and Anegada. The main international airlines serving the Caribbean are: American Airlines, US Airways, Continental Airlines, Caribbean Airlines, Delta Airlines, Cayman Airways, Air Jamaica, Air Canada, British Airways, Virgin Atlantic, BMI, Air 2000/First Choice, Britannia Airways, BWIA, Lufthansa, Air France, KLM, Air Europe, Lauda Air, LTU Martinair, Holland Excel and Corse Air. The local airlines that service the BVI’s are: American Eagle, Caribbean Sun, Caribbean Star, Winair, Cape Air and Liat. There are also private charter flights that can work out cheaper than scheduled flights if you are arriving as a large group. The following airlines provide this service: Air Sunshine Inc, Caribbean Wings, Flight Adventures International Ltd, Fly BVI Ltd, Island Birds and Island Helicopter Int. Ferries are also available and run frequently between Islands. Travellers need a valid passport, return or onward ticket and all the documents required for their next destination. Except: Canadian passport holders require a valid passport or original birth certificate together with an official photo ID. NOTE: American travellers also require a valid passport; this change took effect from 23 January 2007. 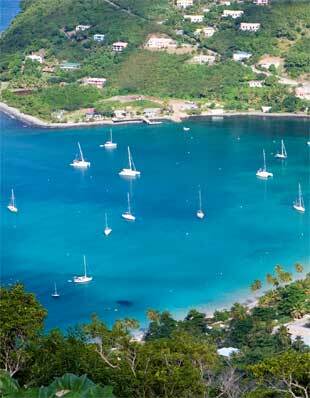 From the 1st January 2008 all entry to the BVI’s will require a valid passport. English is the official language of the British Virgin Islands. 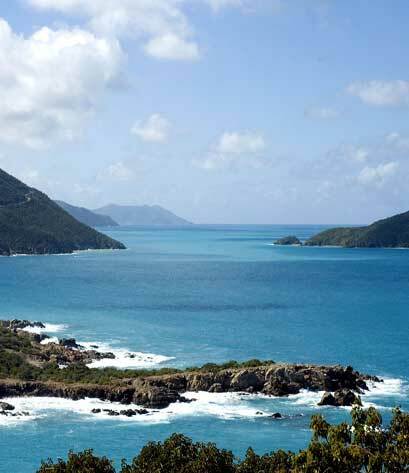 The British Virgin Islands have a reverse osmosis water system and so the water is safe to drink. If you have any droughts it is advisable to drink bottled water. Manchineel trees are very poisonous; the fruit is know as a Manchineel Apple and smells and looks like small apples. DO NOT touch or eat this fruit. Jellyfish arrive in the summer months and can give a nasty sting. If you are stung, leave the tentacle in place, use Vinegar or alcohol on the sting to neutralize. Use an antihistamine cream to stop itching. Never rub the sting. Petty theft does occur in the BVI. Service Charge - 10%, this is often added to the bill so check before you leave further gratuity. Cruising Tax: Seasonal rates (December 1st – April 30th) = $2.00 per person per day. Out of season (May 1st – November 30th) = $0.75 per person per day. The removal of any marine life from British Virgin Island waters is illegal without a recreational fishing permit. A temporary one month license can be purchased for $35. Boats must use the National Parks Trust mooring buoys at designated reef and diving areas, the mooring are for day use only and the payment for this is the purchase of a Marine Conservation Permit. Yellow = Commercial dive boats only. Large yellow = Commercial, or day sailing vessels over 55 feet. White = Dive used for non commercial vessels. 90 minutes time limit. Blue = Dinghies only, day use. Diving, fishing and snorkelling are not permitted at the Horseshoe Reef Marine Protected Area, Anegada. British Virgin Islands currency is the US Dollar. ATMs are available at banks in Road Town, Rite Way grocery in Purcell, East End, Sopers Hole, West End and at Spanish Town, Virgin Gorda. Credit cards are widely accepted in hotels, bars, restaurants and larger supermarkets. The smaller local shops do not accept credit cards and it is always wise to check payment methods before shopping. Credit cards may also have an additional processing charge. Cheques and Travellers Cheques are accepted but are subject to a 10¢ stamp duty. BVI are in the Atlantic Standard time zone. GMT -4. Daylight Saving Time is not observed. 110 volt A.C. electricity system. The standard electrical plug is the same two flat blades and a rounded grounding pin.